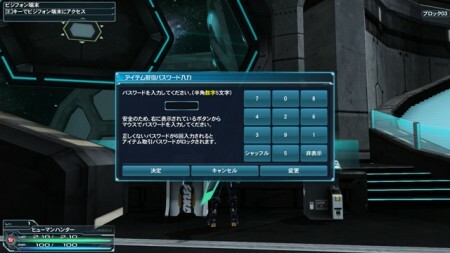 Starting September 4th, PC players will have the ability to set up an item trading password. It is an extra security measure that prevents unauthorized item transactions among compromised accounts. PC players who are not taking advantage of the One-Time Password feature will be required to input a password when trading items or using My Shop services. PC Players who are using the One-Time Password (OTP) service will not be required to set up an item trading password. 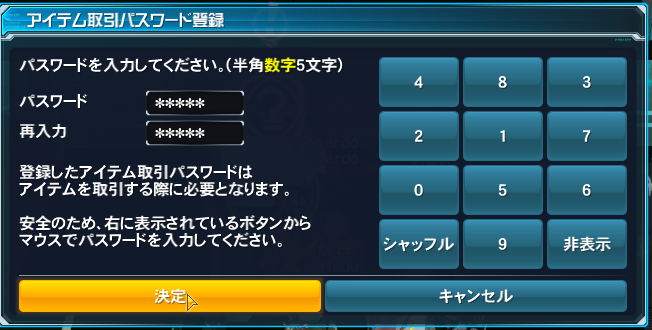 An Item Trading Password will be required once per signed-in session. You do not need to enter it again until you logout and log back into the game. The PlayStation Vita version will not have to use an Item Trading Password for now. Item Trading Passwords can not prevent unauthorized access to your account. For this particular situation, we recommend setting up a One-Time Password for complete security. If in the unlikely event that a OTP enabled account was compromised, players utilizing this service will be able to report on lost or stolen items directly to the administration team. A message will pop up the first time you access the My Shop menu from the Visiphone. 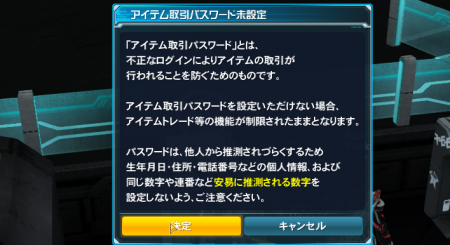 This message is summarizing the details as explained above the purpose of the Item Trading Password. Press the left blue button to get started! Type in a 5 digit password of your choice. You can type in this password through either the keyboard or mouse. If you use the mouse, the numbers are shuffled around just in case someone is tracking your keystrokes. You need to type the same password twice before you can continue. Once you’re done, you can use My Shop and trade services without reentering your password until you sign off and sign back on. 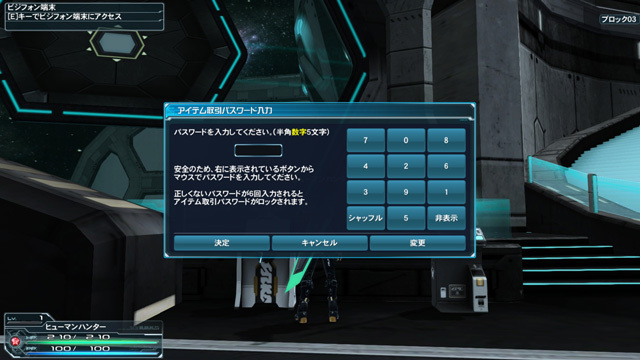 You will be locked out of Item Trading services if you fail to input the correct password after 6 attempts. If by any chance you’ve forgotten your password, you must submit an application through the Password Reset Request form. Once logged in, check the box underneath the SEGA ID, and type in your email address and push the blue button. Please note it can take up to 72 hours for them to process your request.